The oceans currents have formed 5 gigantic whirlpools where the plastic waste collects. A recent study conservatively estimated that 5.25 trillion plastic pieces are currently floating in the world’s oceans. 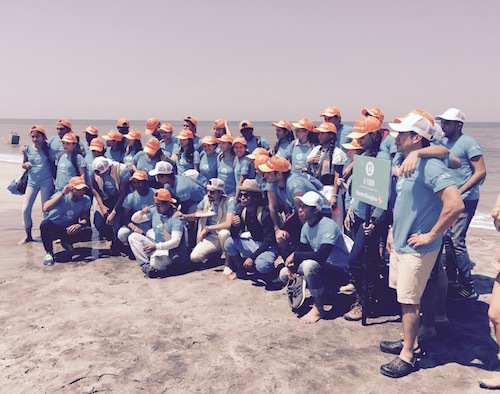 shore clean-up initative by Hunter Douglas. are essential to keep beaches and coastlines clean. Get in touch and we will notify you when the next U-Turn™ takes place in or near your region. If you want to arrange and conduct a u-Turn™ cleanup on your own, here's a useful prep-guide. Bionic® is a material engineering company who has innovated a high performance eco-thread using recycled plastics recovered from beaches, shorelines, and coastal communities to protect the ocean from plastic pollution.